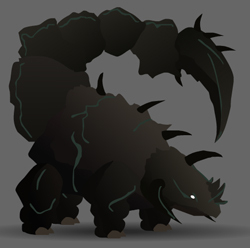 Thanators are very rare, large, tailed beasts found in Blackwhisper Cave. They are the toughest of all the enemies that you can meet in a random battle encounter. You can find them at any time inside the cave, if you are unlucky enough. They have two attacks, one where it hits twice with its tail. The other is an armor piercing attack with the blade at the end of the tail. The name is a homage to the Thanators in the movie Avatar.